I love things in my home that do double duty. When you need less ‘stuff’ to keep your home in tip top shape, it’s less to buy, less to store and less to keep track of. Of course, I had heard of using crumpled up dryer sheets in stinky shoes to take away the smell; who hasn’t? But I was surprised to discover the huge volume of other uses for fabric softener, in and around the home. Whether you’re a diehard liquid softener user or you prefer the sheets in your dryer, I’ll bet you didn’t know about some of these ways to use your fabric softener to do something other than soften fabrics! 1. Remove stubborn wallpaper. Add a capful of fabric softener to a litre of water, stir and brush onto your wallpaper, letting it soak in for about 20 minutes, after which it should peel off beautifully. 2. Keep paint brushes soft. If painting is your next decorating project, after you’re done peeling the wallpaper off, you can avoid your brush bristles going all hard and brittle by adding a little fabric softener to your rinse water for the brushes. It will help keep them soft and supple for the next time you want to use them. 3. Refresh stale fabrics. Using a one to one measure, mix your fabric softener with water and put it in a spray bottle. Lightly mist sheets – no need to soak them – that have been sitting on the guest bed for a while to refresh them. You can also use it on the interior of your car, to get rid of food, dog, and kid smells! NOTE: Test a little on your fabric before spraying it to make sure that you don’t have too much concentration of softener, which can stain some fabrics. 4. Stop carpet shocks. If you are getting shocked by static build up in your carpet, every time you walk over them, mix a cup of fabric softener with 2 litres of warm water, put in a clean spray bottle and lightly spritz your carpet. Again, don’t soak it. Just a light mist. Let it dry and you’ll get fewer shocks! 5. Pet hair in the carpet? Mix one part fabric softener with two parts water and spritz the carpet before vacuuming. The hairs will stick to the fabric softener and become easy to vacuum up. 6. Reuse a dryer sheet to make your bathroom sparkle. A damp, used sheet will shine up the chrome from the calcium deposits and remove the soap scum from your bathroom shower and sink better than any chemical product! It will work on your car too! Have a ring in the toilet bowl? Put a used sheet at the end of your bowl cleaner and with one wipe, the ring should lift! 7. Save your burn roasting pan. Put it in the sink, fill it with warm water and drop in a new dryer sheet. Leave it overnight and presto: by morning, the burnt bits will be loosened up and will have detached from your pan or be easy to scrape off. This also works with paint brushes that need to be cleaned. 8. Forget the feather duster. Used dryer sheets can be recycled into dust magnets! Simply run them over whatever surface you would normally use a duster on! The static fighting qualities will help lift up the dust, quickly and easily. And for ceiling fan blades that get simply coated with thick dust? A damp used dryer sheet will wipe that off in a trice! What else can a used sheet be used on? Eyeglasses, window blinds, baseboards… Not only will it help remove dust but the anti-static properties will help keep dust from accumulating as quickly! 9. Deodorant marks on your clothes. A used dryer sheet that is wiped on the marks with quick, sharp strokes will remove them! Other personal uses for dryer sheets? You can rub one on your head if you have static-y hair, put a new one in your suitcase when travelling so that your clothes stay fresh smelling until you arrive, and soak a used one with nail polish remover to get the stubborn glitter polish off that your kid decided was best to use for your Sunday morning mani. You might also like to know how to save money on laundry. Talk about all around double, even triple, duty! Do you have other ways that you use fabric softeners in your home? Awesome tips! Thanks for sharing. I didn’t know any of these. I’m so happy I found this post, it has some great ideas I can use. Thank you for sharing. I never knew about the static thingee!! That’s so cool! I am so going to try this this winter!! This place is a major shock house! Thanks! Never knew the Pet hair in the carpet one, with 4 pets I am going to have to give that one a try. 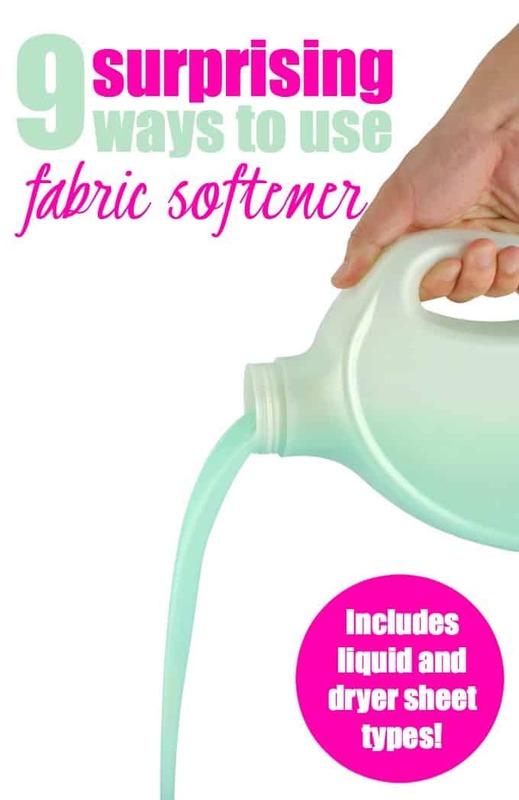 I love fabric softener, and now I have more ways to use it – yippee! These are great tips, some are very new to me! Especially about the roasting pans! Great trick for the chrome in the bathroom. Mine is always dull so I’ll have to try that. Great tips. Will help alot. I already use the fabric softner tk make my homemade freebreeze but it’s also great for cleaning walls, door and skirting boards with too. Not tk mention making your home feel fresh.